The uniqueness of the Coronet Guinea Pig lies in its crest, with a large rosette right on the top of its head! 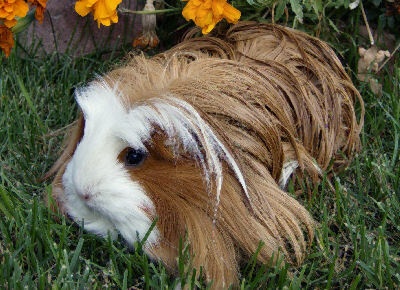 The Coronet Guinea Pig is one of the long-haired guinea pig breeds. It is similar to the Silkie Guinea Pig, but the Coronet has with a coronet or "rosette" in the middle of the head. This distinctive whorl of fur is lacking in the Silkie. This emerging breed is quite the showstopper. Coronets are playful, curious and affectionate. They crave attention, and between their funny antics and unusual look, they attract it naturally. Whether you want a fun yet cuddly pet or a show animal, the Coronet Guinea Pig is a fine choice. The Coronet Guinea Pig requires more grooming than short-haired breeds. If keeping it as a pet, you might wish to keep its hair trimmed shorter than you would for show purposes. Regular brushing is the key to keeping the coat looking great, and if you don't have time for that, this may not be the breed for you. Background: The Coronet Guinea Pig was first bred in England in the mid-1970s. It came from the crossing of a Silkie Guinea Pig with an American Crested Guinea Pig. The breed was separately developed in the United States beginning in the late 1970s, using Silkies and non-conforming White Cresteds with longer hair on the rump. This breed was first recognized by the American Rabbit Breeders Association in 1998. Description: Coronet Guinea Pigs are quite similar to Silkies, but they have a crest on the top of the head. The hair should not have a part. Unlike their White Crested ancestors, their crests may be any color, and they are allowed to have white on any part of the body. Coronets can also be found in Satin, a coat that is denser and glossier. The Coronet Satin is not recognized by the ACBA. Color differences: The Coronet comes in a wide variety of colors and patterns. Any guinea pig color is acceptable for showing. Availability: As one of the newest guinea pig breeds, the Coronet Guinea Pig is not easy to find in many areas. Breeders are probably the best place to look. Prices are usually around $25 to $30. Did you know, Guinea pigs do MUCH better with at least 1 friend Guinea Pig? I got my first the summer of 2009, I was her third owner, she was also very poorly treated, then, we got her a friend, American Guinea Pig, Loki. She was sooooo much happier, even for a crancy of piggy. When she passed, we had to get another one because Loki always had a friend, so we got a mixed breed, Abyssine and Teddy bear. I don't know if she is a teddy bear, she has long hair, but albino, so it's hard to tell. I need your magazine for guinea pigs and rabbits. I have one guinea pig, and that guinea pig is so cute.